The Salone del Mobile has kicked off this week, transforming the fashion mecca of Milan into a design mecca. Designers, architects, makers and buyers have entered Milan from all corners of the globe for what is indisputably the world's best furniture fair. On display this year at the Rho Fiera exhibition is the Ribbon Chair, designed by VIV PROJECTS, a Melbourne based furniture and product design studio led by Vivianne Kollevris. Kollevris is an engineer-turned-designer who is inspired by the beauty of geometric shapes, her work focuses on the purity of shape and its potential to become something extraordinary. 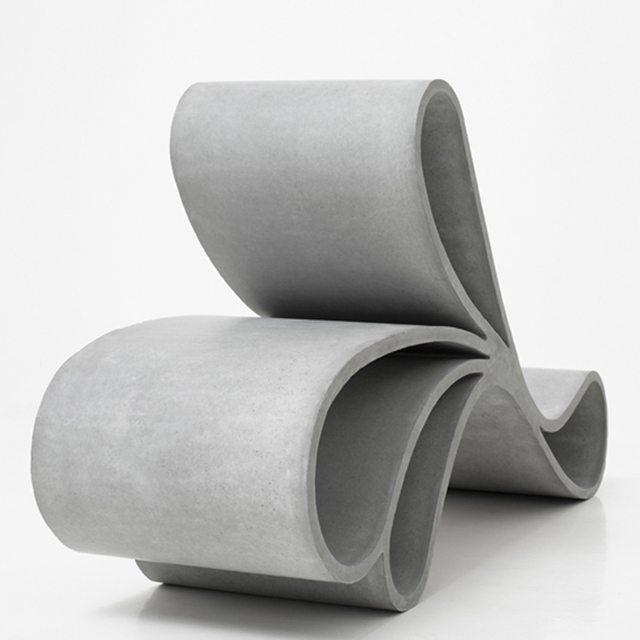 The Ribbon Chair exploits the potential offered by high performance fiber reinforced concrete to create a piece of furniture unlike any other. At just 22mm thick, the Ribbon Chair utilizes the tremendous strength offered by concrete of this type to produce a thin and elegant form, in contrast to what one expects to see from concrete. The chair almost seems like it has been captured in a moment of time, a moment of movement ready to unravel into another amalgamation of curls. Kollervis says she used her background as a professional structural engineer to combine "creative and engineering skills to develop this distinctive design that challenges preconceptions on how an object should work, look and feel."